1681: William Penn charters Colony of Pennsylvania. Large—scale immigration to the English Colonies begins. 1715: Virginia state capitol at Williamsburg — One of the first significant civil buildings in the United States — Georgian architecture. 1753: Construction of Pennsylvania State House completed. The Georgian building would later come to be known as Independence Hall. 1762: Faneuil Hall built in Boston, MA — Georgian architecture. 1775—1783: American Revolutionary War. Despite winning their independence, the colonies continue to model their architecture on English forms for many years. 1782: Completion of Monticello (Thomas Jefferson's home estate) — the beginning of the rise of Federal architecture — Colonial architecture with Greek and Roman influences. 1789: US Constitution Ratified. George Washington becomes 1st President. 1801: Thomas Jefferson becomes President of the United States. Rise of Federal Era. Most early colonial houses built by European immigrants in the 1600s lacked elaborate detail. Today we might call their decorative style "folk," with its rudimentary styling that evoked popular motifs from their homelands — although the structural forms of colonial houses did not always mirror their European counterparts. 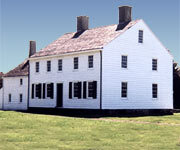 Early American Colonial architecture varied considerably from region to region, its influences depending on the nationalities of the settlers. The metaphor of America as the great "melting pot" found its earliest expressions in the architectural and decorative arts — it's virtually impossible to characterize Colonial architecture as a uniform impulse. The uncomplicated styles of American Colonial architecture and decoration are distinctive for their multiple influences and diverse regional application. English Colonial Seventeenth-century settlers from England brought with them a rural English architecture that resembled late medieval forms. The familiar New England Saltbox and Cape Cod styles were common to this era. Dutch Colonial Houses in the Dutch colonies incorporated steeply pitched gambrel roofs, batten doors and paired chimneys — details common to the architecture in their homeland. The Dutch influence was prevalent in New York City and the Hudson River Valley. 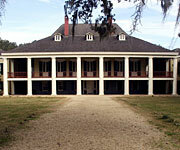 French Colonial Elements of French Colonial architecture still exist in southern Louisiana and along the Mississippi basin. French Colonial homes featured tall, narrow doors and windows. The roofs were hipped or side gabled, and windows often had paired shutters. Spanish Colonial One story, low-roofed dwellings characterized the homes and public buildings of Spain's American colonies. These homes often had a number of external doors but few windows. Stucco and adobe walls and red tile roofs gave these dwellings their distinctive appearance. This style continues to exert its influence in the architecture of the American Southwest. Georgian As the population increased and regional influences intermingled, another style emerged, drawing primarily on forms popularized in England. 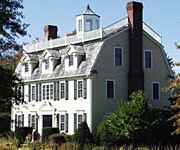 Georgian homes incorporated characteristics of the well-known English Colonial homes along with paneled doors with ornate crowns and support pilasters. Georgian homes were designed to be high-style formal dwellings. They were typically symmetrical and evenly proportioned, with gabled or hipped roofs and double-hung windows with nine to twelve panes for each sash. Colonial Hardware Because casting was expensive, hardware in the Colonial Era was commonly made of forged cast iron. Each piece was individually created by the local blacksmith, hand hammered, then fired to give the piece its distinctive appearance. Few hardware pieces were made from brass or bronze. Hardware common to this era includes the Suffolk latch, strap hinge, H or HL hinges, hand-hammered nails, shutter dogs, and cast iron furniture pulls. Innovations include the thumb-latch, the first machine-made nails, and the elaboration of shutter hardware design.